So I’m keeping to a lean budget these days but I still want to eat well – and homemade. I won’t skimp on ingredients so I’ve found one of the best ways to extend my dollars is by making everything from scratch, even those items that you’d never imagine making at home. Crackers, bread, jam, all of those items we’re so used to buying from our favorite store brands are great, but nothing compares to making it yourself. One of the “luxury” items I’m keeping out of the grocery cart these days is beef jerky. I love the store bought kind but I only buy the best brands (organic, grass fed beef), hence the luxury. In order to make this at home (which I’ve done a few times before) I looked up several recipes and built the one that suited my tastes and wallet, and best replicated my favorite packaged brands. Since I live near LA’s Korea town, I’m apt to visit the ethnic grocery stores in the area and one thing the Koreans do very well is beef. 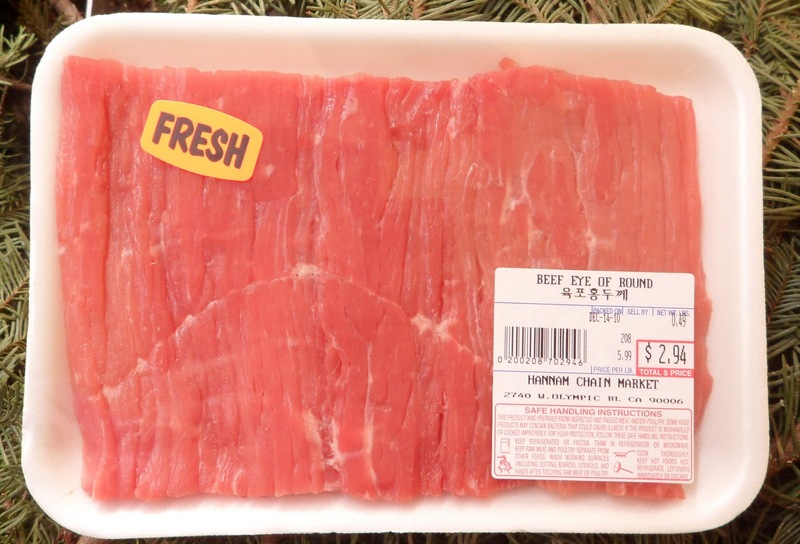 Top quality and perfectly cut for Korean BBQ cooking, these neat little cuts of meat are perfect for producing great tasting (and looking) homemade jerky. 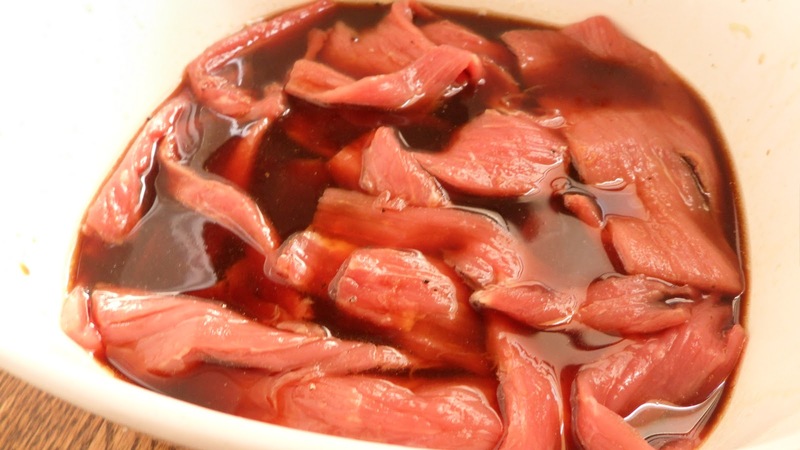 In my research, I found many recommended using beef eye of round or top round for jerky. For today’s batch I chose an eye of round pre-cut in a neat 5 inch by 7 inch rectangle. It’s so pretty! And don’t you love the “FRESH” sticker, as if that’s the signifier for quality? Love it. 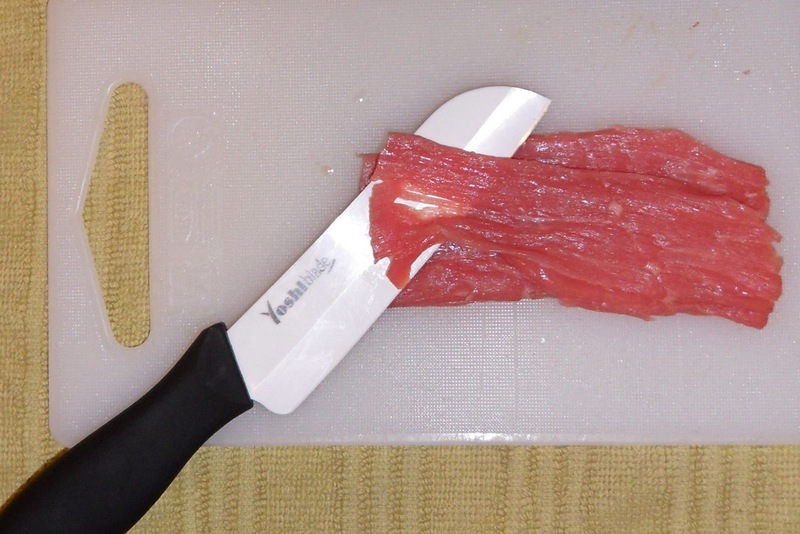 The meat I bought was about 1/2″ thick so to make the pieces a little less toothsome, I very carefully sliced them to a few milimeters thick. Depending on the piece, this meant cutting horizontally either in half or thirds. The below picture illustrates just how thin I like to cut it. Once my meat was properly sliced, and of generally equal sized pieces, I made my marinade. 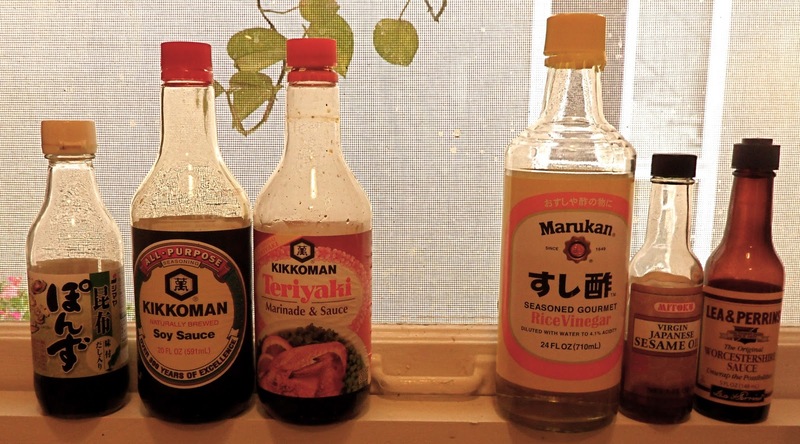 The marinade I like is a mix of several Asian style sauces I always keep in the fridge. Recipes vary greatly so feel free to add/subtract based on your tastes. Pour the following into a flat-bottomed ceramic or glass pan/bowl so that when you place the meat everything will be swimming in the sauce. No diving! Once I added the meat, I weighed it down with a plate and put in the refrigerator. Depending on the flavor you want, I recommend anywhere from a few hours to a day. I’ll probably leave my in until the morning (I put it in the fridge around noon today). 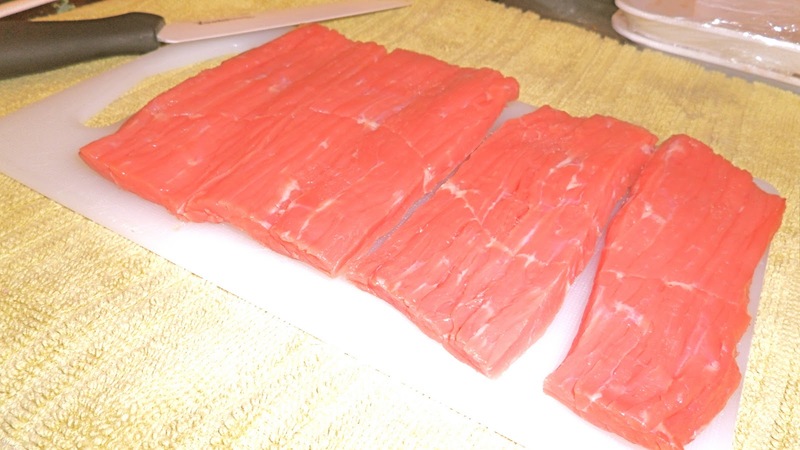 To finish, drain the marinade, dry each piece of meat on a paper towel until the surfaces are dry and arrange them in a single layer in your dehydrator. I’ll capture this when I do it tomorrow and provide an update. I’ll include tips on the best dehydrator temperature and length of time, as well as how to know when it’s done. I can’t wait to get my meat on!